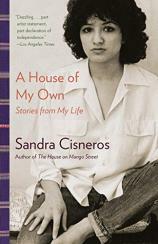 Sandra Cisneros collects episodes from her life in A HOUSE OF MY OWN and shares them in a style reminiscent of A HOUSE ON MANGO STREET. Her new book is more adult and structured, interwoven with beautiful, full-color photographs from throughout her ample life. Yet she maintains a resonance to the vignette style, patterning stories brief and generous alike from different experiences. Thus the book reads with a certain rhythm and feels almost like peeking through snapshots of Cisneros’ life. She takes the reader to her small cramped origins, where she was the only daughter out of seven children. She takes us to the house in Greece where she can’t believe she lived, a young female writer seeking space to create. She takes us through Texas, where she found an audience for her words. And, eventually, she takes us home to Mexico. Cisneros includes speeches and poems from long-past eras of her life, prefacing them with comments and photographs when necessary. This choice creates a completeness within the narrative. Though at times it feels as if she only skims the surface of some of her stories, it is clear that she has included precisely as much as she means to from that particular episode, every piece of her pastiche carefully chosen and pared to present the narrative she intends. The book weaves her writing from 1985 with her writing from 2007 and even 2014, commenting on a past piece to mourn an inspiration, or returning to a declarative judgment to soften it with the insight that comes only from time. "Ultimately, this book is a paean to independence, to self-reliance, to the choices every woman should have and the choices no person should have to make." A HOUSE OF MY OWN is written with a gentle tenderness towards the reader, though perhaps it is a tenderness borne from Cisneros’ mission to help herself through her writing, as she emphasizes in the book. She sees her own writing as inevitable, as medicinal on a deeply personal level. Her connection to her writing is evident in the intimacy that resonates within it. The book reads not like a journal but as a carefully constructed narrative of someone who, at last, understands who she is and where her journey has taken her, and wishes to share it with those who may benefit. Cisneros’ writing encourages readers to write. She speaks that sacred secret sadness of writers, that which has been packaged so dismissively as “madness” in the male literary canon. She illuminates the solitary nature of what it is to always look behind you, to always look within. To be a writer, at least a certain sort of writer, one that she seems to be and one in which I myself find resonance, is to do this unintentionally. Helplessly, almost. Nothing, when you are a writer, is nothing, which can be quite an overwhelming experience, and also quite isolating. Cisneros finds poetry in cheap art, memory in coffee cups, wisdom in the logic of the desperately poor. Nothing is nothing to a writer, least of all when you are mestiza --- when you are mixed, when you straddle two cultures and must make a home in the space between them, in the space only you occupy. She was neither a Mexican girl living in Mexican tradition nor solely American, and so every step of the way she discovered meaning and purpose for herself. Cisneros never married or raised children, and as a Mexican woman in particular --- though this still applies to many women today --- that in itself isolates you from the common narrative. That space is largely unscripted, and as a mixed writer myself, I believe it berths a sort of aloneness that aches to be filled with introspect. To confront meaning in every heartbreak and misstep, in every word of a language you learned as secondary and in every bite of a dish your elders never taught you to prepare --- that is one way to be a writer. For Cisneros, it would seem, it is the only way. Meaning isn’t something to search for but something that is there, that we cannot help but see even if it is desperately painful. Our role is to become a vehicle for that meaning, however we can. This is desperately raw, this awareness. Being conscious is a brutal thing, and Cisneros seems to cope by communicating this consciousness into language, paring it into a piece that expresses what she must release from inside herself. She shifts her experiences into these pieces, and each of them becomes one of her chapters in A HOUSE OF MY OWN. Ultimately, this book is a paean to independence, to self-reliance, to the choices every woman should have and the choices no person should have to make. It is a tribute to the searing quiet comfort of living a life that enables you to build a home within yourself.